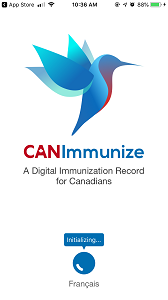 Keeping track of immunizations throughout a lifetime can be difficult, it’s easy to forget to write down each shot in that little yellow records booklet, but now there’s an app for that; CANImmunize wants to help Ontarians make their immunization records digital. Created by the Ottawa Hospital for Research Institute, CANImmunize is making its iOS and Android app available to all Ontarians. The app allows users to create digital records of immunizations for themselves and their families. It’s expanding its availability across the province after successful pilot projects in Ottawa and Kingston. “Immunization is one of the most effective ways to prevent disease but tracking immunizations has been challenging,” Dr. Kumanan Wilson, CANImmunize team-lead, senior scientist and physician at The Ottawa Hospital and professor at uOttawa said in a press release. Currently, the main way to track immunizations is by recording each one in your immunization paper card or booklet. In the province of Ontario, eHealth Ontario is also working on “creating a secure electronic health record (EHR) information system so that medical information can be safely shared and accessed.” However, it admits on its website that, while an EHR is a secure and easy way to store a lifetime of health information, patients do not have online access to their own EHR. Currently, only medical institutions and healthcare providers have access to the digital records. Patients can access them but the process isn’t easy and only paper or printed copies are available. In order to access those records eHealth states on its website “because your digital health record is made up of information from a number of different organizations, you will need to contact them individually.” It then lists six different options for accessing lab test results, diagnostic imaging reports and immunization records for example. The Government of Canada is supporting this work, in fact, it’s working on a nation-wide immunization registry, working with provinces and territories to create this electronic registry. It is unclear, however, how easy it will be for an individual person to access their own records. When it comes to immunization records parents of school-age children are required to have up-to-date records of immunizations for children to be able to join a daycare or school. Additionally, anyone looking to work in healthcare, including IT professionals will often be required to present up-to-date information on shots. The idea behind CANImmunization is making that medical information, at least immunizations readily available on a mobile device. Developed by the Ottawa Hospital mHealth Lab at Algonquin College by Dr. Wilson, CANImmunizatiom app is part of Project Spark, which is an Ontario initiative that helps commercialize digital health solutions. 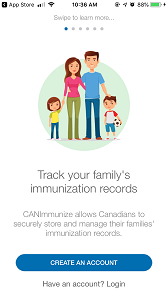 Once you download the app it explains that CANImmunize allows you to “securely store and manage” family immunization records. The user has to upload their own information to the app. But once that that is done you can synchronize the health records across desktop and mobile devices. The app also sends reminders when its time for another immunization, offers facts and recommendations based on province or territory, and can notify users about disease outbreaks in the area. The Institute also plans to use the data collected through the platform to help inform its own research. But according to the app any data collected be will “de-identified” to protect the user’s privacy. According to the press release if this Ontario-wide project is successful the Institute hopes to expand the service, making digital records available between provinces. To date, the app has been downloaded more than 270,000 times. It is supported by the Public Health Agency of Canada, has been recognized by the European Centre for Disease Prevention and Control and is accredited by the World Health Organization’s Vaccine Safety Net.